Naka-dori is a single street that stretches from Otemachi/Tokyo Station to Hibiya. It is a relatively unknown street in Tokyo and a great gem. 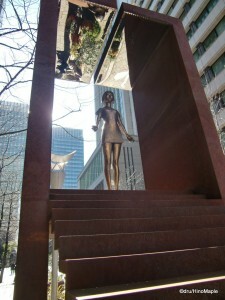 If you have read my post about the Marunouchi area, you will know that is lined with various pieces of art. If you have read my post about Christmas lights in Tokyo, you will know that the street is lined with Christmas lights every year. This street has seen a huge revival in recent years due to the completion of several tall sky scrapers. For those who wish to enjoy a short afternoon or those who have been to Tokyo before but only visited the Imperial palace, this is a nice street to take a stroll. 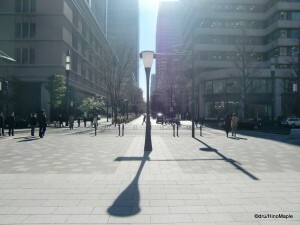 Starting from Otemachi Station itself, finding Naka-dori can be a little challenge. The street starts between the exits of B1 and C14 of Otemachi Station. From there, it’s extremely easy to navigate as you are already on Naka-dori. This area of Naka-dori isn’t very interesting as they are still doing a few renovations but you can already see some of the changes that have occurred. One of the first things you will notice is that the entire street is lined with trees. This is a rarity in Japan, especially Tokyo. The trees may not be that big, yet, but they will continue to grow each and every year. Most of the action starts next to the Marunouchi Building. From here, you can get a better feel for the street itself. The street feels more alike a European street than a Japanese street, yet it’s in the middle of a big city. The street is all brick lined, and as mentioned, also lined with trees. 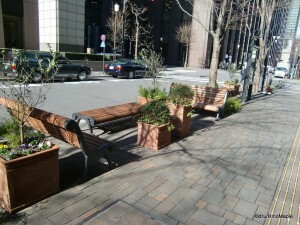 There are lots of various planted gardens along the street as well to give the entire area life. This is a large change from the typical drab and lifeless streets of most areas in Tokyo. The biggest attraction along Naka-dori has to be the free art. If you have seen my post on the Hakone Open Air Museum, or if you yourself have been there, this is an area where you can see something similar. 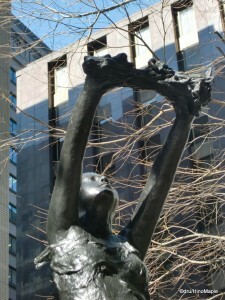 From the Marunouchi Building all the way to the Marunouchi Police Station, you will see various works of art lining the street. Some are new, some are old. Most of the art is actually on loan from the Hakone Open Air Museum. This is probably due to the fact that the owner of almost every building in the area happens to also be the owner of the Hakone Open Air Museum. It’s a wonderful collection that will make you wonder what the artist meant, and some will also make you wonder if it is actual art. Needless to say, it’s something that can be enjoyed. Naka-dori ends when you reach the Peninsula Hotel. While you can go a little farther, the atmosphere actually changes. 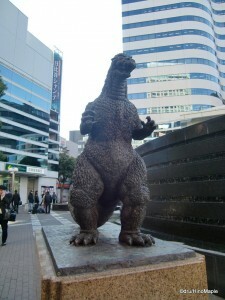 After you pass the Peninsula Hotel, you will come to a plaza with a small statue of Godzilla. It’s a nice secret within Tokyo that is a must for anyone who wanted to meet Godzilla himself. The plaza is also a nice place to visit to see various hand prints and signatures of various famous people. The majority of the plaques are of Japanese people, but there are famous western actors and actresses as well. It’s similar to the Grauman’s Chinese Theatre in Hollywood where you can see the hand and feet imprints of various famous people. The only difference is that these are inverted. They are actually coming out of the floor. If you head a little further south, you will come to the end of the interesting area when you hit the Imperial Hotel. This is a famous Tokyo hotel that is the official hotel for royalty. While most royalty and heads of state will stay in Akasaka in the official guest residence, others will stay here. Next to the hotel is the famous Takarazuka theatre. This is an all female theatre troupe where all roles are acted by women. It is very famous amongst women in Japan and they are well known throughout Japan. You can often see hundreds of people lining the street waiting for the famous actresses to come out and wave to the crowd. It can be a little daunting to walk through but it provides an interesting scene to see. Naka-dori is one of the best secret gems of Tokyo. While you may not see the “traditional” side of Japan, you will definitely enjoy the slow big city life. It’s a unique area that can’t be replicated. Ginza may be the posh shopping area for the wealthy, and Daikanyama is the posh area for the hipsters, but Naka-dori is the place for the office workers to run along and for tourists to stroll. This entry was posted in Tokyo and tagged Chinese Theatre, Chistmas, free art, Godzilla, Grauman's Chinese Theatre, Grauman's Theatre, Hakone Museum, Hakone Open Air Museum, Hibiya, Hibiya Station, Imperial Hotel, japan, Marunouchi, Naka, Naka-dori, open air museum, Otemachi, Otemachi Station, Peninsula Hotel, Takarazuka, tokyo, Tokyo Station, Yurakucho, Yurakucho Station by Dru. Bookmark the permalink.